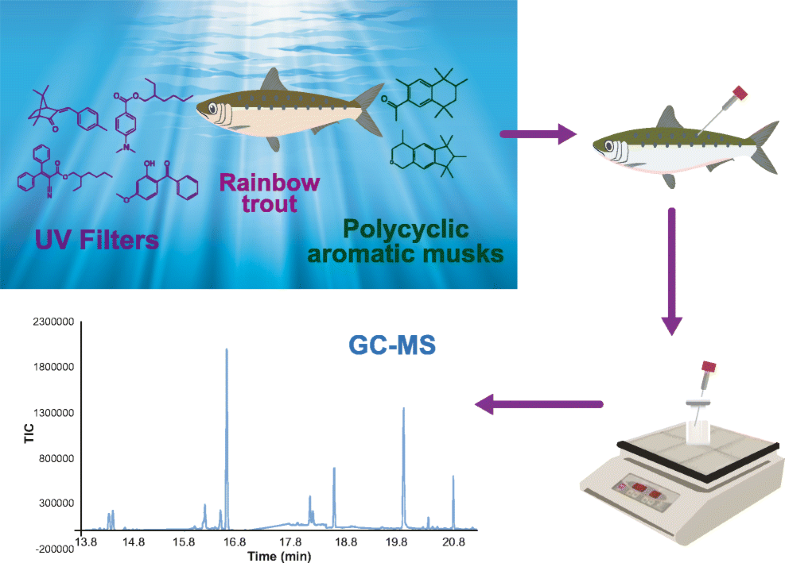 A method was developed for the simultaneous determination of two groups of personal care products, namely UV filters (oxybenzone, 3-(4-methylbenzylidene)camphor, padimate-O, 2-ethylhexyl-4-methoxycinnamate, and octocrylene) and polycyclic aromatic musks (galaxolide and tonalide), in fish by in vivo solid-phase microextraction followed by gas chromatography–mass spectrometry. The in vivo method was validated by carrying out in vitro experiments; the method validation parameters were linearity (r2 > 0.98), interday precision (relative standard deviations < 35.50%), limits of detection and quantification ranging from 2 to 25 ng g−1 and 5 to 70 ng g−1, respectively. The calibrations in vivo and in vitro were determined using a pre-equilibrium sampling rate calibration method. In vivo sampling rate (Rs) was greater than that in vitro; therefore in vivo Rs was applied to the uptake and elimination tracing under controlled laboratory conditions to avoid quantitation error. All analytes were bioaccumulated in muscle tissue over the 5-day exposure in different grades depending on their molecular structure and physicochemical properties; the most absorbed compound was tonalide and the least absorbed compound was padimate-O. The elimination rate was initially high with a rapid decrease of the analyte concentrations for the first 24 h; thereafter, the rate of elimination tended to decrease which indicated that the target analytes were bioaccumulated. To our knowledge, this is the first time that UV filters have been analyzed with in vivo SPME-GC-MS. 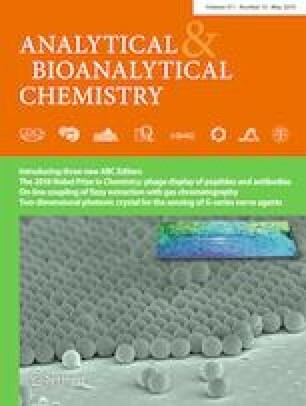 The proposed method is a simple, miniaturized, and non-lethal alternative for the determination of personal care products in living organisms. The online version of this article ( https://doi.org/10.1007/s00216-019-01791-5) contains supplementary material, which is available to authorized users. This work was supported by Dirección General de Asuntos del Personal Académico from the Universidad Nacional Autónoma de México (DGAPA-UNAM) [grant PAPIIT: IN 218116] and Faculty of Chemistry [grant PAIP: 5000-9026]. The authors want to thank Consejo Nacional de Ciencia y Tecnología (CONACYT) for the doctoral scholarship awarded to Iran Ocaña-Rios (scholar number 273473). The authors also want to thank Mr. Pascual Sánchez Ramírez for providing the trout, Rocío Juárez Cipres for technical support and Perkin Elmer de México S.A. for instrumental GC-MS support. All animal experimental procedures were approved by the Bioethic Committee for Animal Health (CICUAL, Faculty of Chemistry, UNAM). Birkholz DA, Stilson SM, Elliott HS. Analysis of emerging contaminants in drinking water. In: Ahuja S, editor. Comprehensive water quality and purification, volume 2. Elsevier; 2014, pp. 212–229. https://doi.org/10.1016/B978-0-12-382182-9.00035-9. Organisation for Economic Co-operation and Development (OECD). Bioaccumulation in fish: aqueous and dietary exposure. In: Guidelines for testing of chemicals. OECD. 2011. https://www.oecd-ilibrary.org/environment/test-no-305-bioaccumulation-in-fish-aqueous-and-dietary-exposure_9789264185296-en;jsessionid=IsLXSzXJvm_hQV0QxkK0ldW3.ip-10-240-5-188. Accessed 12 May 2018. American Society for Testing and Materials. Standard guide for conducting bioconcentration tests with fishes and saltwater bivalve mollusks (E 1022–94). ASTM. 1994 https://www.arpae.it/cms3/documenti/_cerca_doc/ecotossicologia/ASTM_E_1022_bioconcentrazione.pdf. Accessed 01 Feb 2019.